How fickle are we, our reserves get undone by the best player to grace Football in this young century and already the head of the French Maestro is already being called. Didn’t you hear? Barcelona didn’t win f*ck all for six years. Just like er….oh ARSENAL! By the way, this wasn’t back in the 1950’s this was from 1998-2004. As Real Madrid were spending gajillion’s of euros on their ‘Galactico’s’, Barcelona looked at the next generation. Messi, Xavi, Iniesta, Fabregas etc. Just a few names Barcelona had in their camp. Whilst Madrid made the news with established signings (Beckham, Ronaldo, Roberto Carlos etc.) Barcelona made the next established names. Remind you of anyone? It’s like today with the Premier League. Chelsea, Manchester City and Manchester United over-spend to buy the best players around to win trophies, whilst we continue to make new players like Aaron Ramsey and Jack Wilshere through our youth academies or buying these players from other teams and raising them ‘The Arsenal Way’. Look at the last few years, to even match us teams have had to spend 100’s of millions to attempt 4th place, whereas we spent £2.50 on a player most of which probably takes care of his bus-fair from wherever to Islington and yet we’re still making Champions League and still getting close to the League. Not to mention, our big stadium debt which is being dealt with. No fickle green and yellow scarves at our great stadium. Wenger is by far the best manager for the Arsenal job, plays the most attractive football in the Premiership on a shoe-string budget and still manages to get close. Believe! I think in a year or so, our young bloods will take us to finals and win us the Premiership, like they did at Barcelona. 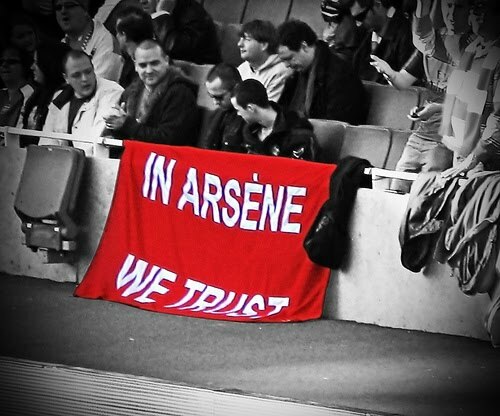 Besides, if Wenger is sacked tomorrow, who in their right mind would we get in without breaking the bank, especially so close to the end of the season where we could still win something who would still play great football. Pep Guardiola? Well last time I checked he was winning everything with the best team in the World. Here’s your answer, there isn’t a soul who can replace Arsène right now and I don’t think there will be. Stick with the manager, that’s the only way we’ll ever win anything.